EDIT August 16, 2018; On his Facebook page, Nairobi Governor Mike Sonko announced that construction work of the AVIC building had been stopped, and Chinese and Kenyan contractors had been arrested for encroaching on a public road. March 24, 2016: Today, Marriott International and AVIC International signed a partnership agreement which will see Marriott operate a 365-room, 5-star J.W Marriott luxury hotel for AVIC in their Africa headquarters and office complex, in Westlands Nairobi. AVIC representatives said the company had been in Kenya for the 20 years, engaging in four areas; aviation (built the new JKIA airport terminal, and supplied Y12 aircraft), education (equipment and training for NYS projects), real estate (in which they hope to create 15,000 jobs), and CSR (sponsoring Kenyans to get educated in China). AVIC is a China state-owned company with 60 global offices. 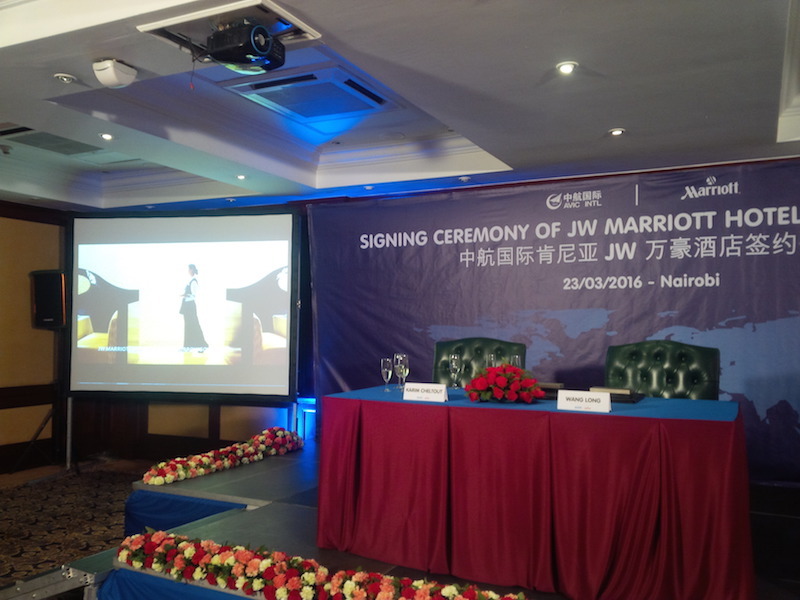 A VP from Marriott said that while they have 110 properties (with 13,000 rooms) in Africa, this was the first J.W Marriott in East Africa and they planned to expand in 5 more countries by 2020 including Rwanda and Zambia. Also that they have 19 global brands, and may open under a different chain in Mombasa, Kenya). He said they have many Kenyans managing and working at their properties in the Middle East, and who were ready to come back home to work. He said that they choose owners and investors carefully to partner with, in China and Africa. Nairobi County Governor Evans Kidero, who was hailed as a supporter of the project, said that the $400 million AVIC complex with JW Marriott hotel represents 6% of Nairobi’s annual new building space and 8% of the annual build cost. He also said that with 5,000 hotel beds, the city is strained when hosting large summits like the upcoming UNCTAD and TICAD 6, which will both be in Nairobi later in 2016. Construction of the AVIC complex started in August 2015. It will have 6 towers, with the tallest being 42 storeys. Building works are ongoing, next to the Villa Rosa Kempinski Hotel that has established itself over the last two years and who challenged the construction of the AVIC complex. This entry was posted in China, Investing in Kenya, Kenya domestic tourist, Nairobi City Council, Nairobi cost of living and tagged Africa, Marriott Hotels, Nairobi Hotels, SinoAfrica on March 24, 2016 by bankelele.